The history of science discipline is contributing valuable knowledge of the culture of soil understanding, of the conditions in society that fostered the ideas, and of why they developed in certain ways. 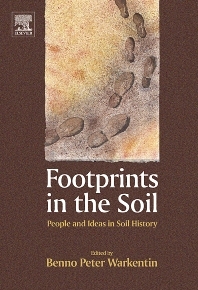 This book is about the progressive “footprints” made by scientists in the soil. It contains chapters chosen from important topics in the development of soil science, and tells the story of the people and the exciting ideas that contributed to our present understanding of soils. Initiated by discussions within the Soil Science Society of America and the International Union of Soil Sciences, this book uniquely illustrates the significance of soils to our society. The chapters are written by an international group of authors, each with special interests, bound together by the central theme of soils and how we came to our present understanding of soils. Each concentrate on soil knowledge in the western world and draw primarily on written accounts available in English and European languages. Academics, graduate students, researchers and practitioners will gain new insights from these studies of how ideas in soil science and understanding of uses of soils developed. The book tell us an interesting history about the development of Soil Science. I was very interesting in the chapter 12, about Soil Chemistry. However, the book is so close to the development of the Soil Science in USA while contributors are mostly from USA. Moreover, the review done in each chapter is of great interest. The literature given can help us to understand the Soil Science History. Although we have to look for the development in ancient times in Asia, specially in China.